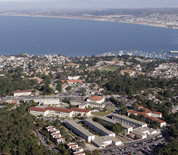 The Presidio of Monterey Defense Language Institute, also referred to as the Defense Language Institute Foreign Language Center (DLIFLC), is located in Monterey, California. The institution conducts educational research and provides linguistic and cultural instruction across the DoD. Military service members attend the DLI to learn a foreign language at a fast pace, ranging from 24-64 weeks in length. The facility is under the jurisdiction of the US Army, but representatives from all branches of the US Armed forces come to the Institute as students and instructors. This Presidio of Monterey directory features the critical info you’ll need to navigate through the many facilities and recreational opportunities available on base.